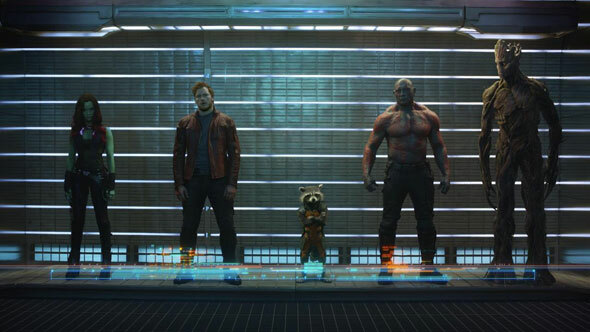 The first official photo has gone online from Marvel Studios’ “Guardians of the Galaxy”. The shot shows the five major characters who make up the team – Zoe Saldana as Gamora, Chris Pratt as Peter Quill/Star-Lord, Bradley Cooper as the voice of Rocket Raccoon, Dave Bautista as Drax the Destroyer, and Vin Diesel as the voice of Groot. From Marvel, the studio that brought you the global blockbuster franchises of Iron Man, Thor, Captain America and The Avengers, comes a new team – the Guardians of the Galaxy. To evade the ever-persistent Ronan, Quill is forced into an uneasy truce with a quartet of disparate misfits-Rocket, a gun-toting raccoon, Groot, a tree-like humanoid, the deadly and enigmatic Gamora and the revenge-driven Drax the Destroyer. But when Peter discovers the true power of the orb and the menace it poses to the cosmos, he must do his best to rally his ragtag rivals for a last, desperate stand – with the galaxy’s fate in the balance. The film is scheduled to hit cinemas on August 1st.